CELSYS, Inc. is pleased to announce the worldwide release of its manga & comics production application for the iPad; “CLIP STUDIO PAINT EX for iPad”, on Wednesday, November 8, today. *1 The application is available in English, French, Spanish, German, Japanese, Korean and Chinese (traditional), and contains the same features as the Windows/mac OS version. Customers who install and register their download by December 20 (Wed), will be able to use the application free of charge for 6 months instead of 8.99USD per month. 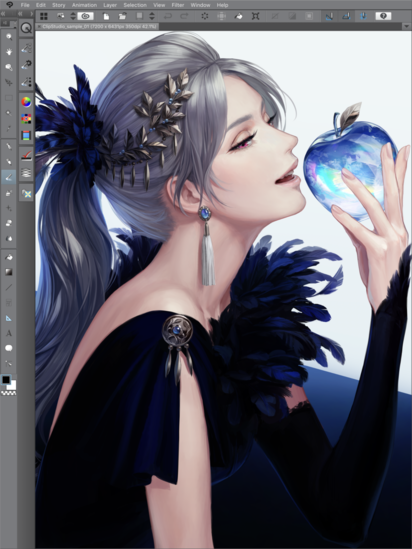 Released in 2012 as manga, illustration and animation production software for Windows/macOS, “CLIP STUDIO PAINT” has been used by over 3 million users worldwide*2, and is now the No. 1 painting tool in terms of market share*3. With its natural and pleasant drawing feel and versatile functions, CLIP STUDIO PAINT is used widely, from hobbyists who draw manga and illustrations, to professional production environments such as professional manga artists and animation studios. The newly released “CLIP STUDIO PAINT EX for iPad” is the iPad version of “CLIP STUDIO PAINT EX”, the flagship model of CLIP STUDIO PAINT, and makes full-scale manga/illustration creation and commercial level animation possible with the iPad alone. In addition, it features Apple Pencil support and makes full use of its precise pressure sensors and tilt detection, accurately adjusting line thickness and shades according to pressure and tilt for an almost hand drawn feel. 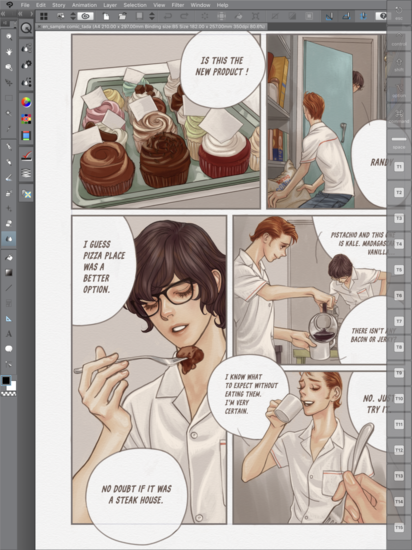 As with the Windows/macOS version, “CLIP STUDIO PAINT EX for iPad” covers the entire process of manga production from drafting to polish and publishing. With extensive features specialized for manga production such as panel layout, speech bubbles, tones, effect lines, etc., users can create complete color and monochrome manga with this single application. Along with tools to create illustrations and animations, the application has various functions to support a comfortable working environment, such as touch operation support, an iPad specific user interface, and an edge keyboard, among others. The canvas area is displayed widely, with an initial iPad optimized user interface. As with the Windows/mac OS version, the interface can be customized to adjust for individual drawing styles. While drawing with a pen, other functions such as swiping and color picking can be used through touch operations, providing a smooth drawing experience. The edge keyboard (above), displayed by swiping the display, can register shortcuts, enabling the immediate execution of frequently used shortcuts. The Japanese Iwata font as well as European fonts, typical for dialogue in manga & comics, are pre-installed. Data created with the iPad version is fully compatible with the Windows/macOS version, and data can be imported with AirDrop or iTunes for finalization on the iPad or PC. Installation and registration by December 20 (Wednesday) will allow free-of-charge use for 6 months. Depending on the used iOS language, the following language versions are available. *1 Distribution start time of the application may differ depending on the region. CELSYS supports creators globally by the production, the browsing and the distribution of graphic contents utilizing IT technology. We also offer services to support their creative activities by illustration, manga and animation production software “CLIP STUDIO PAINT”, web service “CLIP STUDIO”, as well as the e-book solution, “BS Reader” for content creation, distribution and browsing.